Jadielady: Hair dye, Concerts, and Yaarn! Hair dye, Concerts, and Yaarn! Earlier this week, a woman at work was offering up free hair dye. Name brand, usually expensive stuff. Her explanation was that the fullfillment center where her husband worked wasn't going to carry it anymore. Well, I started working up a plan. Phase 1 last night was to put in some honey blond highlights. Phase 2, was to then do some pure blond highlights, and then Phase 3 was to dye them a pretty purplish/pink. Sadly, neither batch of bleach did JACK! 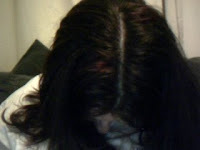 I still went ahead and put the purple/pink on, but its barely visible. Next time I'll just buy the harsh stuff. Tomorrow, Sam and I are heading to Richmond to see Clutch. I'm really excited. While I don't ever feel like I'm dragging Sam to see bands, I know he's REALLY looking forward to see Clutch. Lewis and his lady will be joining us! Then Sunday I'm heading to visit my parents for Easter. There will be lots of knitting, and movie watching, and peace and quiet. I hope anyone who's traveling this weekend has a safe trip! See y'all next week. email me - you were one of my pay it forward people from my blog wayyyyy back in November - I want to make something for you but need to get in touch with you..
Yeah, she's back *grumbles, no new blog about her trip to redneckville* Welcome home Jadielady!!! ooooh maybe Kunnecke is going to make you a Kangaroo meese.